Cuomo’s out!As we mentioned a few weeks ago, likely gubernatorial candidate and current New York attorney general Andrew Cuomo leading the investigation into potential misdeeds by the current governor raised some conflicts questions. Cuomo apparently agrees, and announced today that he will appoint independent counsel to investigate Gov. 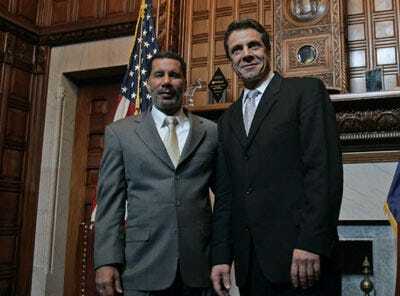 David Paterson’s potential interference with a domestic violence case, The New York Times reported. Paterson’s then-aide, David Johnson was accused by a former girlfriend of assault. The New York Times has previously reported that Paterson and members of his staff spoke to the woman about the case; she failed to show up for a court hearing a day after speaking with Paterson and the charges against Johnson were dropped. Johnson resigned following The New York Times’ reports about the potential connection between the Governor’s office and the case. The NYT has the full report.